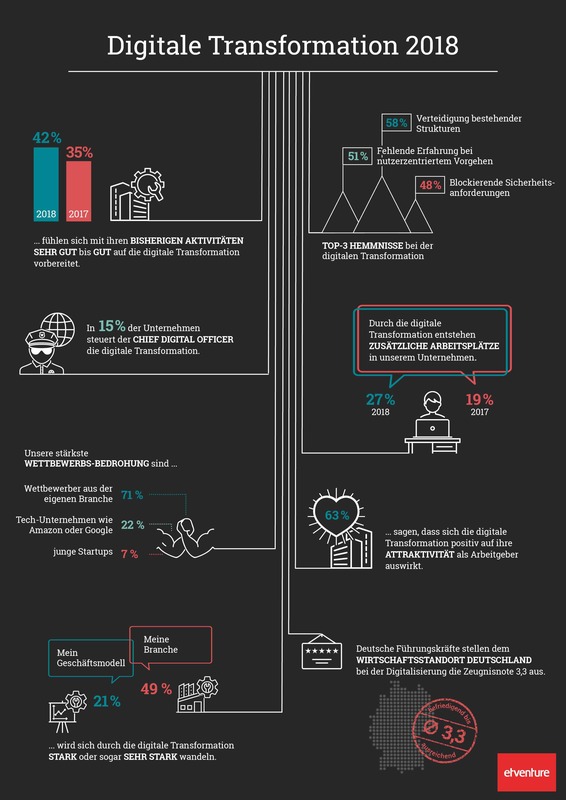 For the third time in a row, etventure’s “Digital Transformation 2018” study provides an assessment of the status quo of digitization in German companies. Together with GfK, decision-makers in major German companies with at least 250 million euros worth in business were interviewed. The major essence of the study: German companies think themselves safe with regard to digitization. Tech companies such as Google or Amazon are not perceived as competition. >Click here for the free-of-charge trend report on the study with a detailed presentation of the results, thematic digressions and expert opinions. In its report on the etventure study entitled “The dangerous self-overestimation in digitization”, the Frankfurter Allgemeine Zeitung (FAZ) sums it up. After all, large German companies feel significantly better positioned in terms of digitization by now. However, the further results of the study raise doubts about the alleged progress. First and foremost, this begins with the definition of digital transformation: the majority of interviewed decision-makers interprets it as “the digitization of the existing business model and analog processes”. Only a minority of 28 percent includes the development of new digital business. Even more astonishing is that around half of the companies anticipate strong or even very strong change as a result of digitization in their respective industries. In contrast, only one in five companies feels a similar pressure for change in their own business model. It is not the case that companies are idle. Quite the opposite, German business leaders have realized that it is time to take action and the majority of companies have started their first digital initiatives. In many cases, a close alliance with start-ups is being sought or digital labs are being established. But the concrete implementation of the digital transformation continues to be difficult for companies; tangible success is rare. “I feel frustrated because companies are aware that digital is an issue and they need to start acting. But with regard to employees and the business model, not much has changed,” adds Philipp Depiereux in the FAZ. Companies and SMEs are still mainly struggling with internal obstacles such as the defense of existing structures, in other words the “preservation” of the company. In addition, there is a lack of experience in user-centric methods and a fast digitization is impeded by security requirements. “Companies stand in their own way as they undergo digital transformation,” states Philipp Depiereux. “This calls for companies to break away from existing ways of thinking and procedures, to start digitization outside the core organization with its established processes and routines and, above all, to involve their employees in this change”. In addition to the FAZ, numerous other media have already commented on the etventure study. “German corporations are holding themselves back” was the title of Spiegel Online‘s report on the study. DIE WELT dedicated a detailed report to the study. And amongst others, Internet World Business, Horizont and Computerwelt also featured articles. In our free-of-charge digital trend report we have compiled detailed results from the etventure study “Digital Transformation 2018 – Obstacles, Progress, Perspectives”. In the report, we do not only present the figures, but also provide a classification of the results through video statements and thematic digressions.